Special Research Program SFB-54: "InThro"
Thrombosis is a hallmark of life-threatening diseases, such as myocardial infarction, stroke or venous thromboembolism representing major causes of death in the western civilization. In 2014 the Special Research Program SFB-F54 (“Cellular Mediators Linking Inflammation and Thrombosis”) was launched at the Medical University Vienna financed by the Austrian Science Fund (FWF), which comprises a network of eight research groups that are focusing on molecular and cellular links between inflammation and thrombotic diseases to provide a new view of thrombosis integrating the role of inflammatory processes thereby building up new strategies for therapeutic interventions. Our Special Research Program SFB-F54 has been extended for a second funding phase from 2018 - 2022. 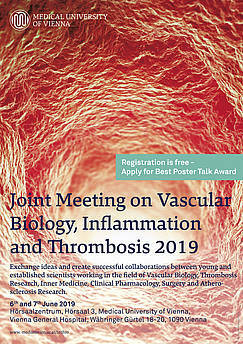 Register today for the Joint Meeting on Vascular Biology, Inflammation and Thrombosis 2019 (June 6 + 7 in Vienna) !! Impressions of last year's Joint Meeting! Title: “The playground of fluorescence microscopy” 2018-11-14 1 pm Medical University of Vienna Department of Biomedical Imaging and Image-guided Therapy Pokieser-Seminarraum, 7 F more details can be found.. The SFB participated in this year’s “Long Night of Research” (“Lange Nacht der Forschung”). This only nationwide science communication event that makes the services of local institutions accessible to the general public- took place on Friday,..
Congratulations! Graduation of first SFB's PhD student Lena Hell! Lena successfully defended her thesis on January 11th 2018. We are very happy that Lena will stay in the Pabinger-group and continue her postdoc career at the MUV. Konstantin Krychtiuk "Gefährliches Erbe mit langer Geschichte"
Standardinterview: Sylvia Knapp "Jede Menge Wissenlücken beim Immunsystem"
Sylvia Knapp "Jede Menge Wissenlücken beim Immunsystem"